Detailed account of the history of the dispute, burgeoning military capabilities on both sides of the border in the Himalayas and full-scale clashes. For a hundred years, British and Chinese territorial claims in the Himalayas conflicted, with Indian historians claiming that the region was the fountainhead of Hindu civilization. In the halcyon days of the Raj, London saw Afghanistan and Tibet as buffers against Russian and Chinese imperialism. In 1913, an ephemeral agreement between Britain, Tibet and China was signed, recognizing the McMahon Line as the border of the disputed territory. China, however, failed to ratify the agreement, while India protested against a loss of historical land. After the Second World War, India became independent of Britain and Chinese Communists proclaimed a peopleis republic. Despite cordial overtures from Indian Prime Minister Nehru, in late 1950 the Chinese Peopleis Liberation Army (PLA) invaded Tibet. 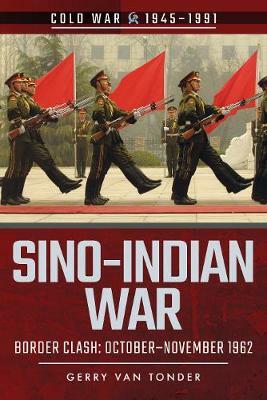 In the ensuing twelve years, Indian diplomacy and Chinese icartographic aggressioni were punctuated by border incidents, particularly in 1953 when armed clashes precipitated a significant increase in the disposition of troops by both sides. In the spring of 1962, Indian forces flooded into the Ladakh region of the state of Jammu and Kashmir, to check the Chinese. In a spiralling game of brinkmanship, in September, ground forces were strategically deployed and redeployed. On 10 October, thirty-three Chinese died in a firefight near Dhola.i Embittered by Moscowis support of India against a sister communist state, and in a bid to clip Nehruis belligerent wings, on 20 October, the PLA launched a two-pronged attack against Indian positions. Born in Southern Rhodesia, now Zimbabwe, historian and author Gerry van Tonder came to Britain in 1999. Specializing in military history, Gerry has authored _Rhodesian Combined Forces Roll of Honour 1966-1981_; _Book of Remembrance: Rhodesia Native Regiment and Rhodesian African Rifles_; _North of the Red Line_ (on the South African border war), and the co-authored definitive _Rhodesia Regiment 1899-1981_. Gerry presented a copy of the latter to the regiment's former colonel-in-chief, Her Majesty the Queen. Gerry writes extensively for several Pen & Sword military history series including 'Cold War 1945-1991', 'Military Legacy' (focusing on the heritage of British cities), 'Echoes of the Blitz', 'Death Squads' (on massacres and genocides) and 'Architects of Terror'.